Intrepid Sea, Air & Space Museum's new StationLIFE exhibit provides a near-real-time feed from the International Space Station and a view into NASA's space station technology. NEW YORK — The view on the new museum display is a busy one: It includes astronaut Twitter feeds, tracking details for the International Space Station (ISS) and videos describing NASA's space program technology. It's all a part of StationLIFE, an exhibit designed by NASA to show the science, the technology and a bit of the human side of the space station, including almost-real-time data from the station itself. StationLIFE opened at the Intrepid Sea, Air & Space Museum in New York City in April. 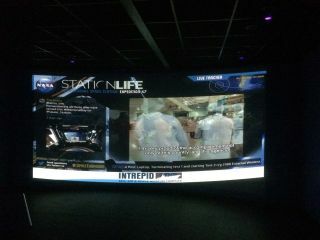 The StationLIFE feed could be installed anywhere, though one unique thing about the Intrepid display is the use of a projector rather than a typical TV screen, said Mitch Youts, media producer and special projects coordinator at NASA's Johnson Space Center. Typically, he said, the exhibit uses a 55-inch (140 centimeter) monitor. Each StationLIFE installation has a Wi-Fi hotspot to pull the data. A division of the ISS program funds the exhibits, and there are five other installations besides the one at the Intrepid, including one at the Smithsonian Air and Space Museum in Washington, D.C., and another at the Chicago Museum of Science and Industry. "The design is flexible and updated from time to time," Youts said. "Additionally, the displays can utilize an alpha channel for other graphic overlays and things, so each installation can have a customized look, such as a museum logo or something of that nature." The exhibit pulls astronaut tweets from Twitter, and the video and news feeds all come from a central location. Various public relations teams at NASA produce the content. Some of the data transmissions — Twitter feeds, for example — aren't completely real-time, Boehm said, as the space station's internet access isn't constant. And the Twitter feeds will sometimes replay again after their original debut, as will the video, Boehm added, noting that this can sometimes lead to odd pairings. "[Former astronaut] Scott Kelly came in here when the exhibit opened and saw some of his tweets from the ISS on the screen," he said. "He took a selfie with them."